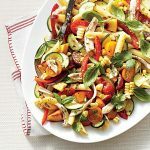 Find the recipe for Farmers’ Market Pasta Salad from Southern Living here. Find Southern Living’s 51 Summer Farmers’ Market recipes here. See all the great recipes and delightful southern charm of Southern Living here. Lost Cowboy is powered by	WordPress 5.0.4 and delivered to you in 1.981 seconds using 43 queries.